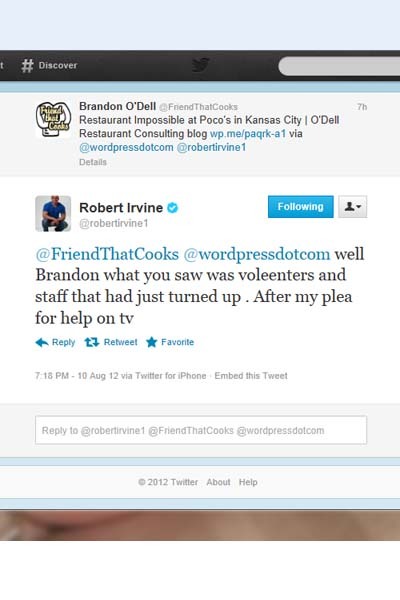 I recieved some feedback via Twitter from Robert Irvine of Restaurant Impossible about my recent article Restaurant Impossible at Poco’s in Kansas City. 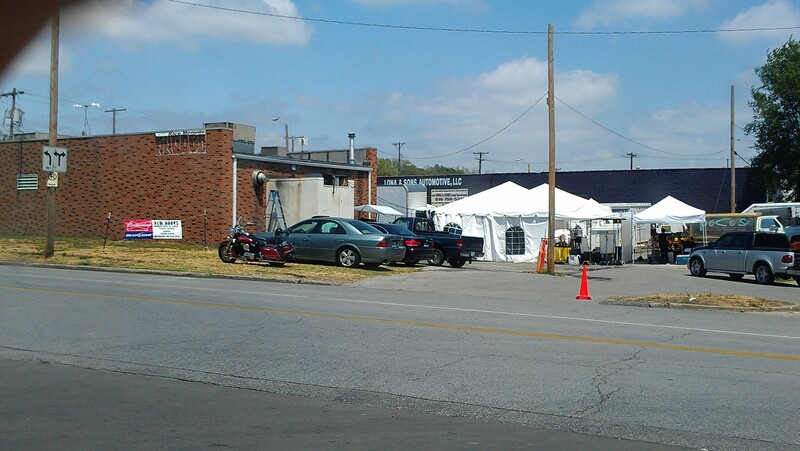 I posted some pics of the outside of Poco’s in Kansas City while the Restaurant Impossible crew was there giving the restaurant the “Robert Irvine treatment”. In the article, I commented that I didn’t see the “frenzy” of activity I always see on the show and I asked some questions that I’ve been curious about since shows like Restaurant Makeover, Gordon Ramsay’s Kitchen Nightmares and Restaurant Impossible have been helping struggling restaurant owners fix their menus, their decor, and even their attitudes. 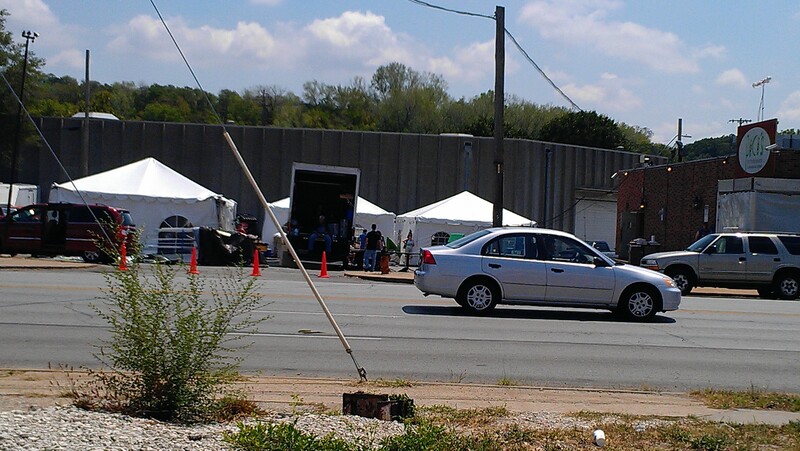 My questions include inquiries about what happens after the Restaurant Impossible crew is gone. Is there support after the makeover? You can read those specific questions in my article here. 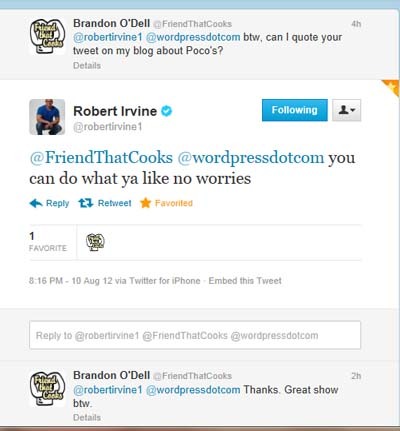 I tweeted a link of my article to Robert Irvine and apparently he read it because he tweeted back to directly answer my most pressing questions. Here is our Twitter conversation, and make sure you are reading my own tweets back to keep everything in context. Also, I believe in full disclosure. 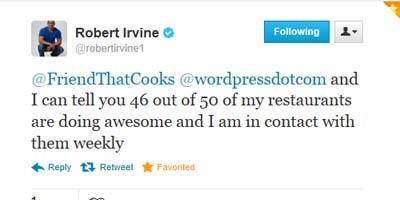 I am a fan of the show, though it does not reflect the type of work I do with restaurants, and I appreciate Robert’s willingness to engage his fans. Two of my favorite shows are Restaurant Impossible and Gordon Ramsay’s Kitchen Nightmares. If you haven’t seen them, and you’re in the restaurant business, you’re missing out on a lot of free lessons. Gordon Ramsay is a bit of bully. He likes to push people’s buttons. 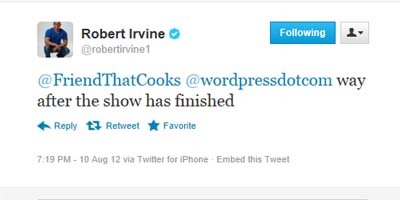 I think one of his other shows, Hell’s Kitchen, is just a stage for him to berate future chefs for ratings and money. 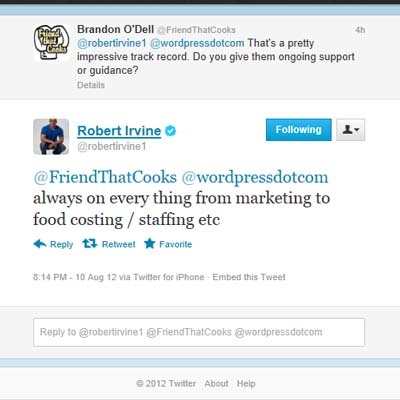 Robert Irvine is a bit more respectful, but still tough. That said, I still think those two show are the most important shows on television for current and would-be restaurateurs. 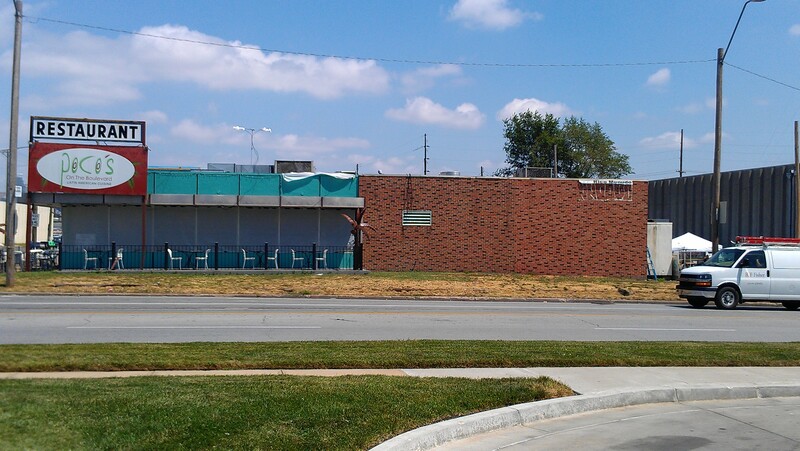 If you watch Kitchen Nightmares or Restaurant Impossible, you’ll notice a reoccuring theme with many of the failed restaurants Ramsay or Irvine help; large, unfocused, unmanageable menus. I’m not sure what it is about the restaurant business that turns an average cook into an overbearing, pretentious egomaniac chef or restaurant owner that thinks they can stick something on a plate no one has ever heard of before and people will pay them $50 a plate to eat it, but I wish they made a pill to cure that disease. At the very least there should be therapy available to help these people realize that if a world renowned chef like Gordon Ramsay can be humble enough to cook simple food with quality ingredients, then they should be also. Enough with the whining. I’m starting to annoy myself. What I really want to talk to you about, is how to create a manageable menu for your own restaurant. There are three main factors I think you should concentrate on when you are putting together your menu. Notice that nothing in that list refers to ‘what you want’ to serve. To tell you the truth, it’s not important what you want to serve. For more on that, check out Don’t give your customers what you want. First things first. Something you’ll see in a lot of independent restaurants is owners or chefs trying to do the impossible by offering a larger selection than their equipment, facility, ability or staff can handle. You need to realize that these things limit what is possible out of your restaurant. You can’t just go and write your dream menu without considering the factors that will affect your ability to produce the food on that menu. Your menu selection needs to be limited to only the number of items that you have the equipment to cook. It also needs to have items that spread the work load across the different stations and equipment in your kitchen. If you have 10 different saute items, and only 4 burners, you’re going to keep a lot of people waiting for their food. People NOT being served quickly, means that tables aren’t turning, and you aren’t serving as many people during your rush that you can. In most restaurants, at least 80% of the day’s revenue comes from the rush periods where you are putting through as many people as you can possibly serve. If your huge selection means you can’t serve as many people during a rush, then you won’t make as much money as you could. Your menu should also be limited to only the number of items you have the storage room to store ingredients for. If you’re working with a two door reach in cooler and a top loading, three foot wide deep freeze, you’re not going to be able to offer all those fun creative dishes you learned to make in culinary school. Limited storage space means limited menu. You can make the most of your storage space by getting multiple orders per week, but even then, you’ll have to watch your space. There has to be a spot for everything, and stuffing more things in a cooler or freezer than was meant to be in there means you don’t have quick access to it in a rush, which means slower service and less money as we’ve already covered. Your ability may be the first limitation you want to consider. Just because you are the best at cooking whatever it is you think is your specialty, doesn’t mean you’re good enough at teaching other people to produce it to your high standards enough to feed a huge angry mob. It also doesn’t mean that people are going to think whatever you’re cooking is as good as you do. You need to be honest with yourself and work within your limitations. Cook what you KNOW how to cook, not what you’ve seen other people cook. If you’re not an expert on everything on your menu, it will show. Maybe your customers won’t know how to verbalize it and let you know that your food really stinks, or maybe they’re just too nice to say it, but it will still show in the ever decreasing number of guests you’ll serve. Your staff is another limitation you have to take into account when creating a menu. You can’t produce haute nouveau cuisine with minimum wage cooks. Every market is different for hiring talent. Every manager and chef is limited by their own ability to find qualified help. If you can’t find help that can make a two egg hollandaise in a job interview, then you don’t need to have hollandaise on your menu. Limit your offerings to what your staff is qualified to prepare. If you want a menu that works, it has to work for your potential customers. Whatever idea you have about introducing some new, awesome cuisine to a market that hasn’t seen it yet, forget it unless you have tons of marketing cash to educate the public with. People rarely eat what they don’t understand. I know you think your idea is different, and the food you want to bring to the area is soooo good that people just HAVE to love it, but you’re most likely just projecting your tastes on the general public. Unless you have tens of thousands in marketing dollars to educate a new market enough to create an interest in a new type of food, you’re not likely to bring them in. People try new foods based on buzz. When it starts to get popular, people try it. When it gets to be the “in” thing to eat, people try it. Until your target audience knows about the food you’re going to serve, they won’t have an interest in it. How can they, they don’t even know what it is? Find out what your customers want, not what you want them to eat. Make your menu about them. Stick to foods your customers are familiar with. A good place to start is at the local farmer’s markets and grocery stores. See what meats and produce the markets carry. Those are the things people in that area buy. Those are the ingredients they know and are comfortable with. If you can find items that are even grown locally, all the better. If you have to have everything flown in from some exotic far away place, people in your area aren’t likely to know what it is or even care. Sure there are some adventurous people out there like me that love to try anything new and interesting they can get their hands on, but we are the exception, not the rule. I checked my ego long ago to make myself realize that it’s not about me, it’s about whoever I’m feeding. Once you’ve made it about your customers and figured out what they want, create a signature item in each menu category. These signatures items should speak to your unique selling point, and really communicate to your customers what you are all about. I also suggest that you make them the highest gross profit items in their respective categories. You’re wasting your time if you’re not making money, so naturally a manageable menu is one that gives you enough money to pay your bills. While I’m not going to go into detail about pricing in this article, I am going to make the obvious point that you’re in business to make money. When creating a menu, you need to consider how much every item on your menu costs to make. How much does every person who walks through your door cost you in overhead to serve? How much profit do you need to make for this restaurant venture to be worth your while? These three financial considerations combine to give you the information you need to set the prices on your menu. From there, you just have to keep your price points competitive for the market, and make sure your food offers a good value for what it is. Your food doesn’t have to be “the best”, but it does have to be worth what you’re charging. Pricing your menu by a budgeted food cost isn’t an effective method of ensuring you will collect enough money to pay the bills. You need to consider every cost of running your business including the rent, insurance, utilities, equipment, maintenance, small wares, labor, taxes and benefits to name a few. All together, the other costs of running your business make up a lot larger part of your financial picture than your food costs do. You have to estimate all these, determine how much you need from every customer to cover these, and price your menu based on all the costs of doing business, in addition to profit. Creating a manageable menu is just the first step in rolling out a new restaurants menu. Read our article on how to roll out a new restaurant menu to get a great step by step guide on getting your menu from conception to implementation. I hope this article gives you a couple things to think about before creating your menu. Just keep in mind that big menus equal big waste, big theft, big product costs, big ticket times, and big service issues. Less is more. A small focused menu that accurately conveys who you are and what your restaurant is about will make more money than any big menu. I only have to bet my reputation that I’m right, you may have to bet your business you’re not wrong.